Kale is a great snack for you shrimp, plus it contains approximately 135mg of calcium per 100g. Kale can be dried, blanched or fed fresh to you shrimp. If you plan to grow it yourself simply purchase a packet of seeds or seedlings at your local hardware store or nursery and follow these steps to ensure you grow large, healthy kale. Kale can be planted anytime of the year but is best planted in soil temperatures of 10c to 30c. If you chose to purchase seeds chose a large pot or garden bed to plant them in, making sure it is in partial sun in summer and full sun in winter. The pot or garden bed should be at least 20 square centimetres for a few plants but for more, larger is better, I prefer a 50cm, circular pot. Kale will grow in commercial potting mix but the addition of fertilizers is always a good addition to kick start you kale. Sow the seeds one centimetre deep, planting the seeds a few centimetres apart and keeping the rows fifty centimetres apart. If you need to you can later transplant seedlings to allow more room. 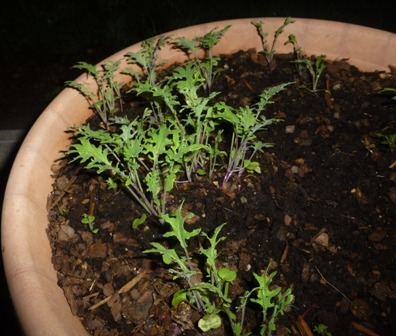 Keep the soil moist and within five to fourteen days your kale should germinate and within eight to ten weeks it should be ready to harvest but may be harvested before if needed/wanted. Kale is fairly resistant to pests and diseases but are susceptible to white cabbage caterpillars. Picking them and dried and withered leaves is your best defence as using pesticides will more than likely harm you shrimp. You can feed to kale to your shrimp fresh, blanched or dried depending on your preference. If blanching, you should boil for approximately one and a half minutes. When feeding, keep the kale down with a wooden/bamboo skewer or tie it to a rock. Your shrimp will love the kale and jump on it as soon as it goes into the tank. Good info. I would have never thought of feeding my shrimp Kale.